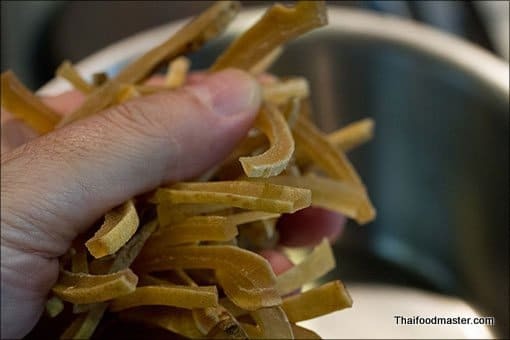 This is the first article in series of posts that I have prepared in the last few months, covering over a dozen Laotian dishes. 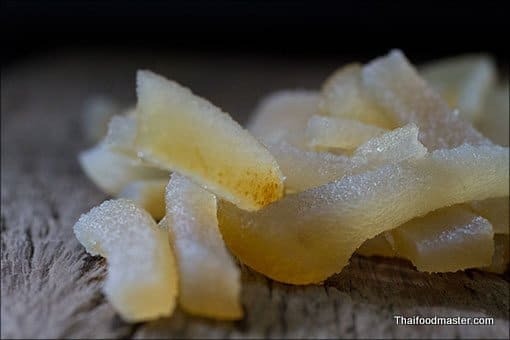 I feel that content related to Laotian Cuisine is appropriate on a Thai Food blog since Northern Thai cuisine (Lanna) and North-Eastern Thai cuisine (Issarn) bear similarities to the Laotian cuisine, and historically, they share similar ethnic origins. While these regions show a wide ethnic diversity, they are mostly populated by descendants of “Tai” people, whom around the seventh century A.D started migrating from what is known today as Yunnan province in China and settled in these areas. 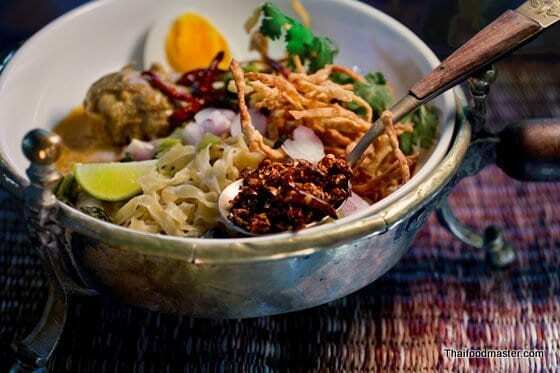 Whereas Thai Cuisine has embraced new ingredients and techniques over the years, most Laotian Cuisine, apart from some French influence, remained mostly untouched. 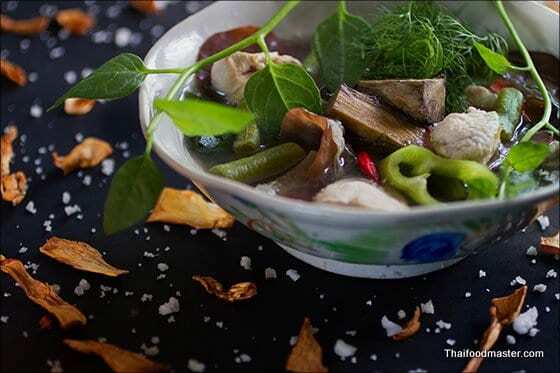 In this context, the authenticity of the Food Culture of both countries is well related and preserved across the barriers of language, ingredients and the regional tastes; we can view Laotian Kitchen as a close relative to Thai Cuisine. 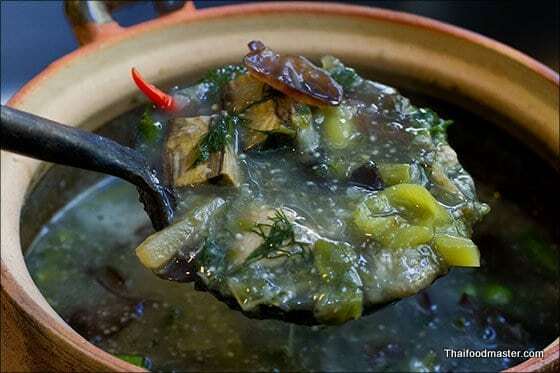 The stew’s base is a mild peppery broth prepared by slowly simmering lemongrass, chili and pepper wood (sakhaan) with the preferred meat, depends on the type of meat, it can be used fresh, dried, salted or grilled. 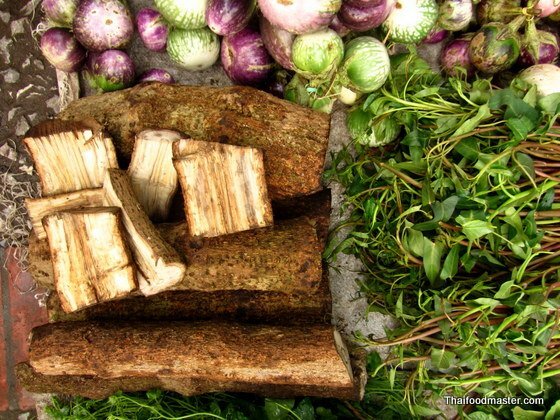 The meat of choice is usually dried and salted buffalo meat, but really, any meat can be used – game meat (usually roasted first), quails, small jungle birds, deer, beef and even the common chicken will make a great Or Lam. 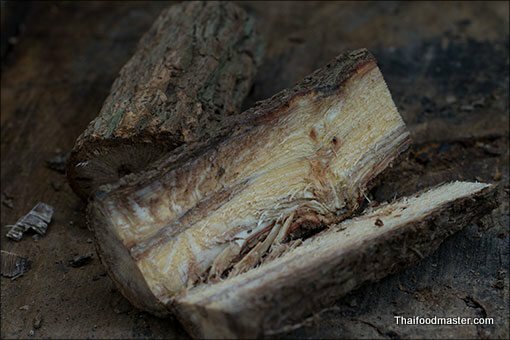 Occasionally, stripes of sun-dried buffalo skin are also added, precooked in salty water to eliminate the leathery odor, to the point where they are soft and gelatinous, with a jelly-like consistency. 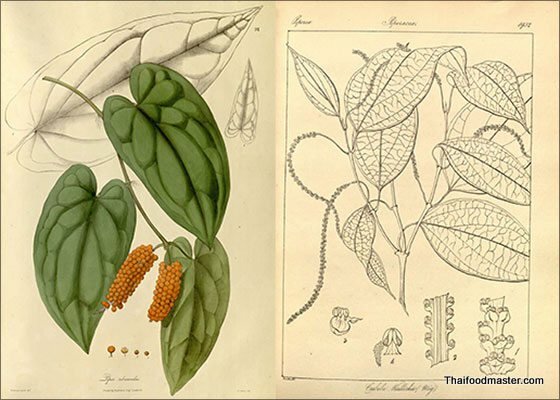 Also commonly used in Or Lam is the wild pepper vine (Piper ribesioides) (Sakhaan, Thai: สะค้าน Lao: ໄມ້ສະຄານ) (Other names: jakhaan จะค้าน, dtakhaanlek ตะค้านเล็ก, dtakhaanyuaak, ตะค้านหยวก ), also known as chili wood due to its spicy, strong peppery flavor and light bitter notes. 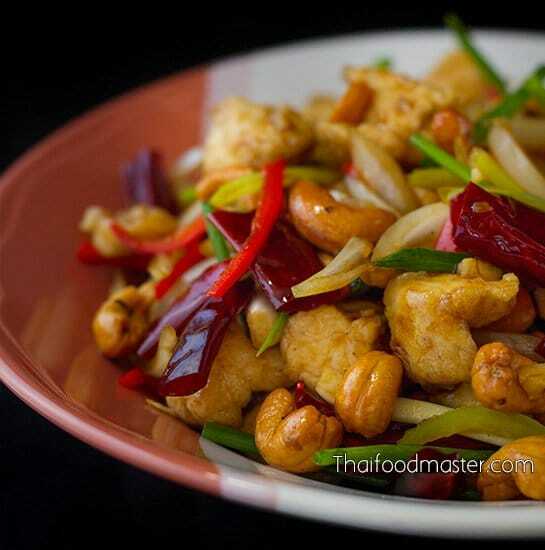 It gives the dish an unmistakable spicy heat followed by, not an unpleasant, numbing of the lips. 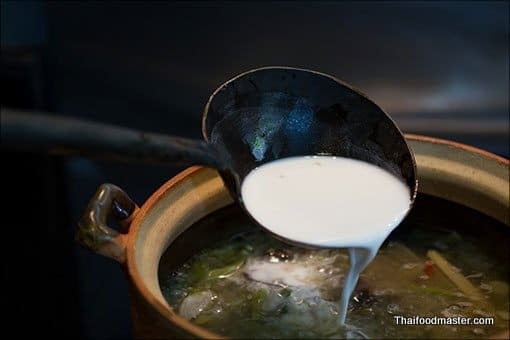 The Sakhaan is peeled and cooked until its outer layers get texture similar to artichoke hearts. 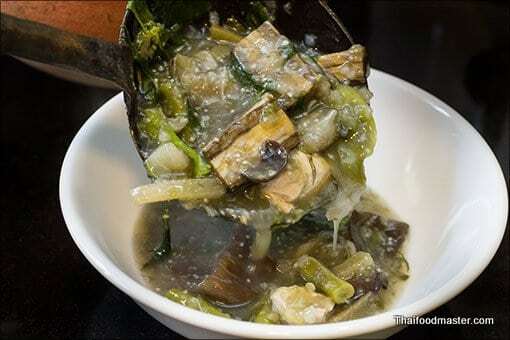 Once the broth is ready, and meat is well cocked, vegetables and black wood ear fungus (het hoo noo ; เห็ดหูหนู ) are added, followed by the bitter green leaves of ivy gourd (dtamleung ; ตำลึง). 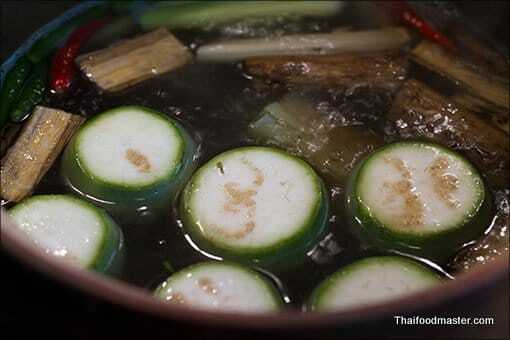 The stew is then thickens to silkiness by adding sticky rice flour and mashed cooked eggplants. 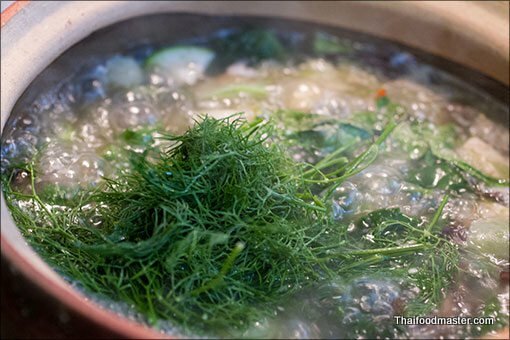 To finish the dish, loads of fresh lemon basil (bai maaengak; แมงลัก) and dill are thrown in, a clear aromatic signal for an upcoming feast. 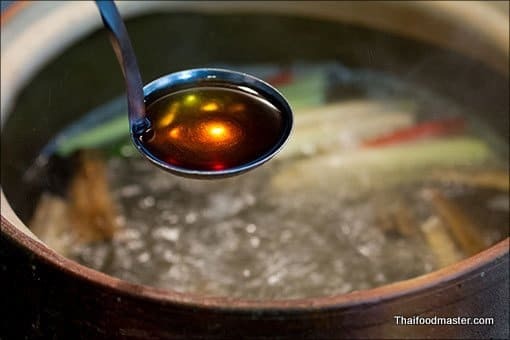 I assume that you would probably need to order a second or even third bowl as I did, before you could grasp the full range of tastes of Or Lam. 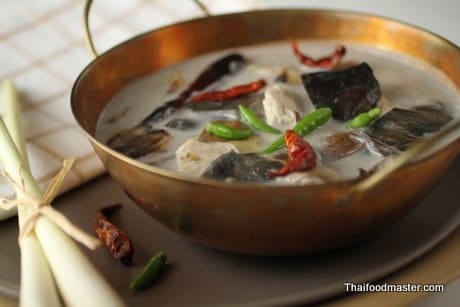 Step by step tutorial: Or Lam (Aw-Laam, Thai: เอาะหลาม, Lao: ເອາະຫຼາມ), Mild spicy thick and aromatic Laotian stew of chicken. 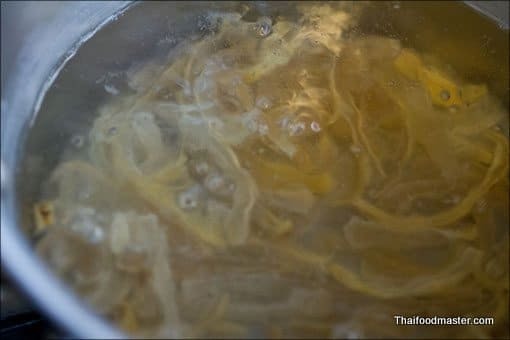 1 cup black ear mushrooms. 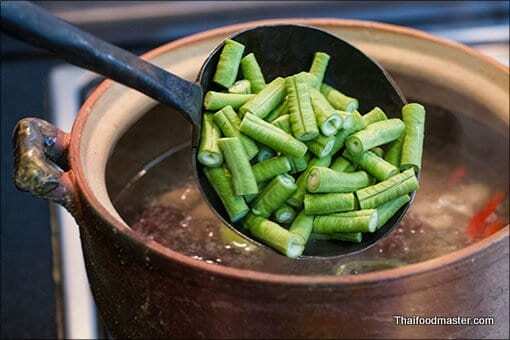 1 tablespoon sticky rice flour, mixed with water. 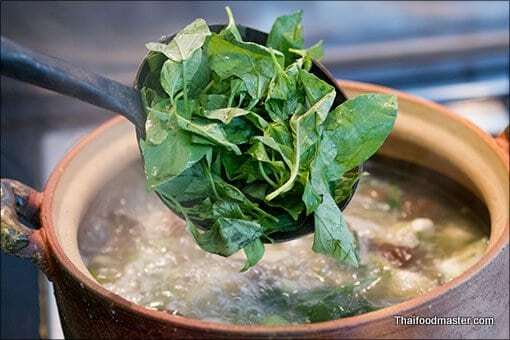 Bring water to a boil, add salt. Add stripes of sun-dried buffalo skin. 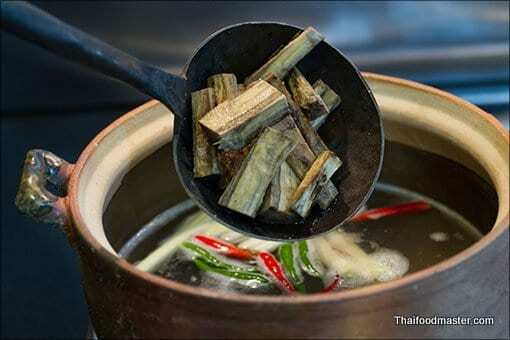 Simmer the buffalo skins in the boiling salted water for about 20 minutes over high flame. 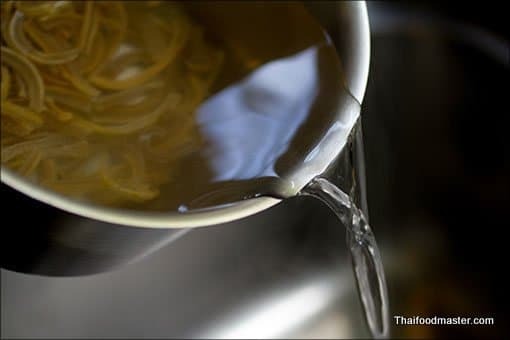 Discard and replace the cooking water couple of times in order to remove bad odors. 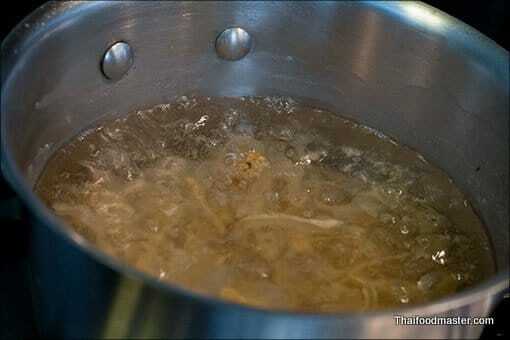 Cook the skins stripes until they become gelatinous and soft. 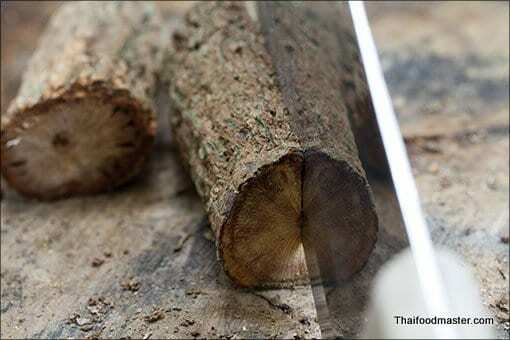 With a heavy knife chop the sakhaan into 15" (4 cm) pieces, then peel off the outer woody layer, and set aside. 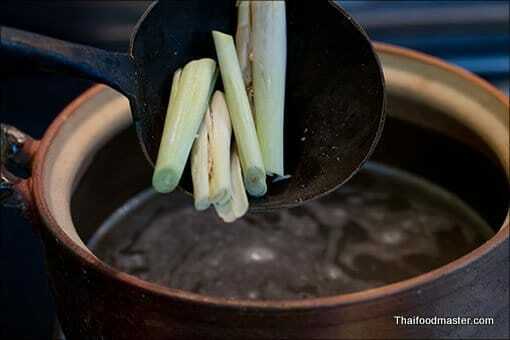 To a large cooking pot bring to a boil 5 cups of water over high heat, then add about two stalks of bruised lemongrass. 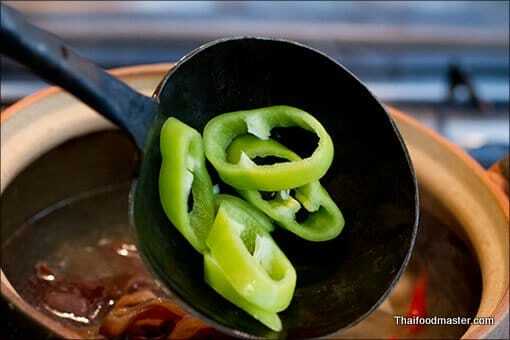 Add 5 to 8 Thai chilies. 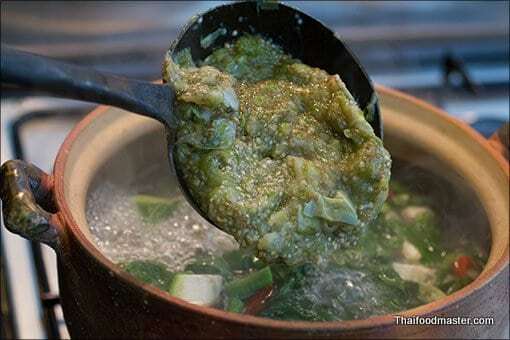 Let it all to simmer together until the sakhaan soften, than add the precooked buffalo skins stripes. While the broth is simmering, add 6 to 8 Apple eggplants. 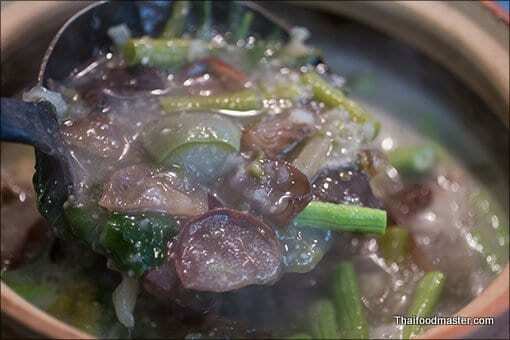 Cook the eggplants until soft. 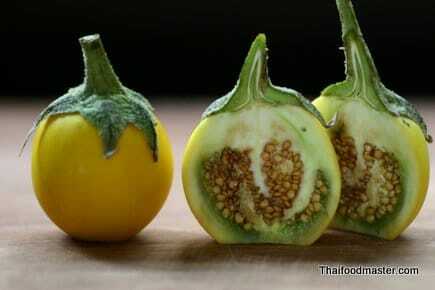 When cooked, remove the eggplants from the pot. 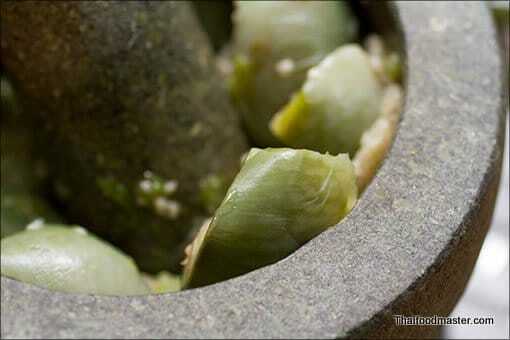 In the paste and mortar mash the eggplants until no lumps are left, set-aside. Add the chicken slices, and let it cook for about 10 minutes, or until done. 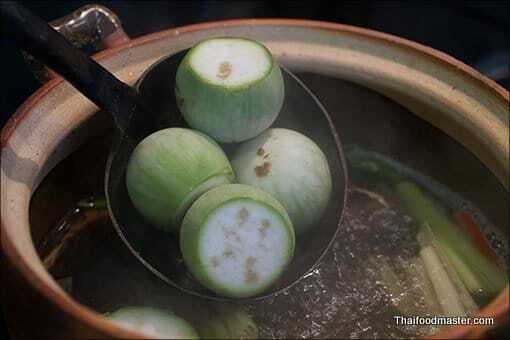 And some more apple eggplants cut in quarters, and cook the vegetables for another 10 minutes or until soft. 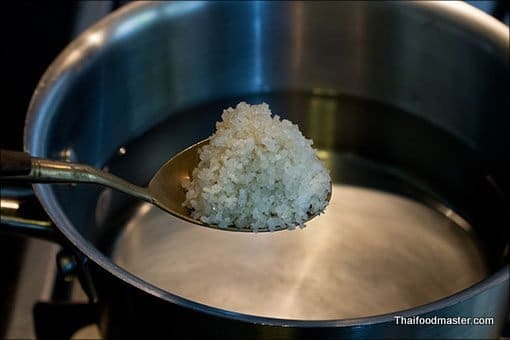 Mix about 2 tablespoons of sticky rice flour with some water and mix well Add to the mixture to the broth; keep cooking until the broth thickened. 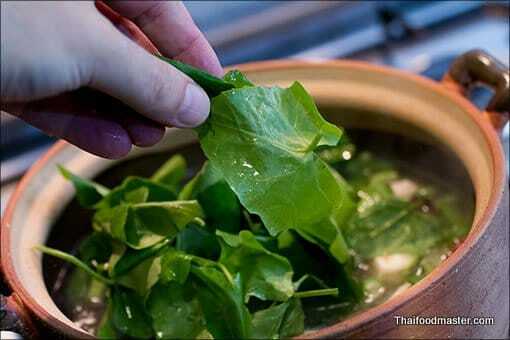 Add the tumbling leaves, and cook for about 5 minutes. 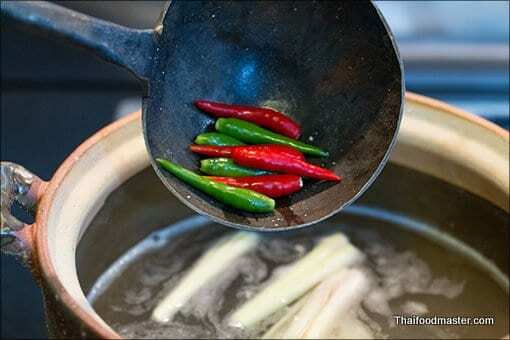 Let everything to cook together for another 10 to 15 minutes so the flavors will merge together. Finish the dish with a handful of dill. And one last picture for food modeling. 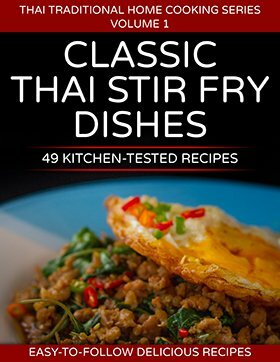 Please adjust cooking time if using different meats than chicken. 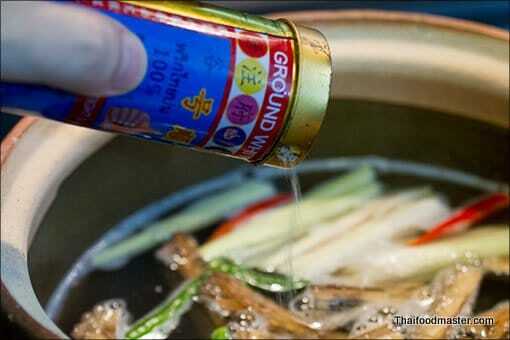 Dried meats should be put in to cook earlier, together with the sakhaan. I’m very glad to see you back! 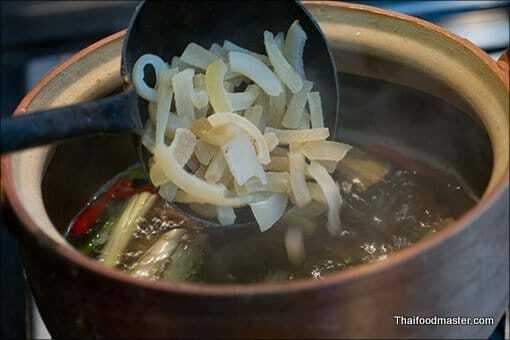 Look like our shan food too. I am from Kyaingtong(eastern of Shan state,Burma). it is gelatinous, if you mean the buffalo skins…..